If you have any question about products, orders you have placed, or want to comment about our services, send E-mail to Customer Service. Shipping ahead can result in increased shipping charge. E-Direct Special Offers are valid only for orders placed online or by phone at time of promotion and cannot be combined with other sale offers or applied to previous orders. Previous purchases from a Woodworking Show do not qualify for E-Direct promotional price. Items that are oversized or overweight may be subject to extra charges and may NOT qualify for E-Direct special offers, promotions, sales or discounts. 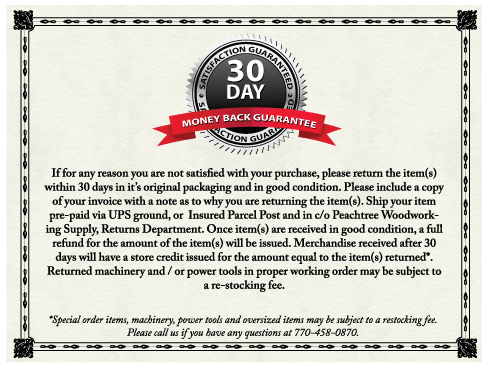 Peachtree Woodworking Supply, Inc. reserves the right to limit quantities, correct errors or omissions and modify or end E-Direct promotion at any time.